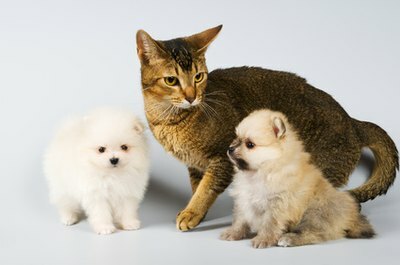 Puppies and cats can live together and may even become good friends with a proper introduction. Dogs and cats don’t have to be enemies. By introducing your puppy to a cat while he is young, you can train the dog to behave himself. A slow introduction will help your cat get used to the new family member, so they can both live in your home comfortably. Keep your new pet in one room or area of the home when you first bring it home. This will give it time to adjust to you and your home, plus it will give the other animal time to get used to the new smell. Give the new pet a clean blanket to sleep on. After two days, switch the blanket with one that the old pet likes to sleep on. Allow the puppy and cat to see each other through a slightly open door. Use doorstops to prop the door open just an inch or two, so the cat cannot get in the door. The animals may growl and hiss at first sight of the new animal. Allow them to do so and sniff at each other. However, close the door if one tries to swat the other. Leave your cat in a bathroom or small bedroom and allow the puppy to explore the house. This will help it get comfortable before the first meeting. Keep your puppy on a loose leash the first time it meets the cat. Use any training the puppy has had so far to keep him in a sit position. He will probably be just as scared of the cat as it is of him. Remove the puppy if one of the animals becomes aggressive. Allowing them to fight may begin a pattern that will be dangerous for the cat as the puppy gets bigger. Repeat this process as needed. Rushing an introduction may seem easier, but training your puppy to stay away from the cat and showing the cat that the puppy won’t hurt her will ensure they can live together as the puppy grows up. Keep the animals separate until you are sure they are comfortable with each other when the puppy is off his leash and out of his kennel, if one is being used. If the cat is willing to sleep and eat with the puppy around, you can be sure it is getting comfortable.